Mari Krueger became a volunteer transporter with the Children’s Heart Project after her 1-year-old son’s heart surgery. She’s a journalist, Navy wife, and mother of two. A boy with a backpack smiles for a photo as he heads into preschool. It’s hardly possible to believe this tall, relaxed boy is the same person as the underweight baby who slept in my arms when I transported his mother and him back to Bolivia after his lifesaving surgery. Santi’s heart surgery—a defining event of his and his family’s lives—was two years ago. I met Santi and his mom, Anita, a few months after his surgery and accompanied them home to his grandmother, two brothers, and church family. A huge crowd greeted them as the car pulled up in front of their home. Everyone wanted to see this cheerful, healed child. And now, two years later, the smile is the same, but his body is transformed. He can play with his big brothers like most other kids. And not just his body is renewed but also the lives of everyone in his family. The family that was long separated is drawing together again. Before Santi’s surgery, Anita would rush from her job cleaning houses to the hospital where Santi lingered sickeningly close to death. Her mother cared for her two older boys for months at a time. Thanks to encouragement she received from their host family in North America, Anita trained for her manicure certificate when she returned to Bolivia. Now, she does hair, makeup and manicures to support her family and is able to spend time with all three of her boys, and she’s grateful. The time she used to spend at the hospital is now spent with her family and serving at church, where she’s involved in the women’s ministry and teaches children about God’s love in the children’s ministry. Her husband wasn’t in the picture two years ago. Now he has rededicated his life to Christ and is undergoing a rehab treatment program. Soon he may return home, too. “This family ministered to my life in a wonderful way,” said Carola Contreras Wann, the Children’s Heart Project coordinator for Bolivia. She’s watched Santi transform from an infant struggling to survive to a healthy, growing boy. 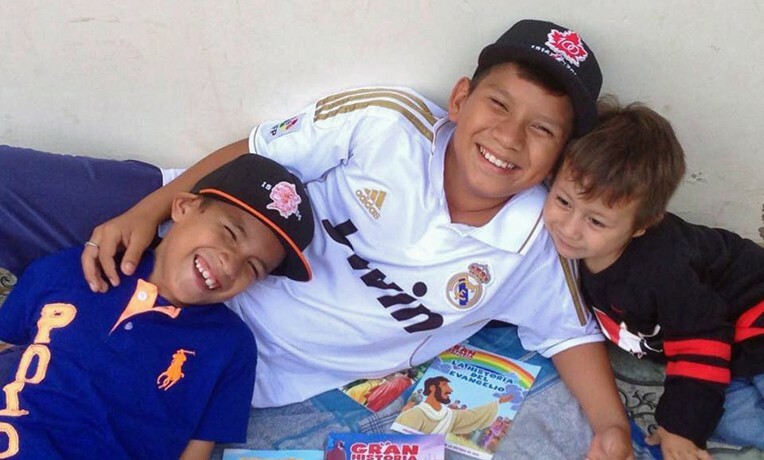 Anita’s pastor at Iglesia Casa de Dios Puerta del Cielo, who encouraged Anita to trust God and take Santi to North America for surgery, adds that Santi continues to do well, thanks to God.